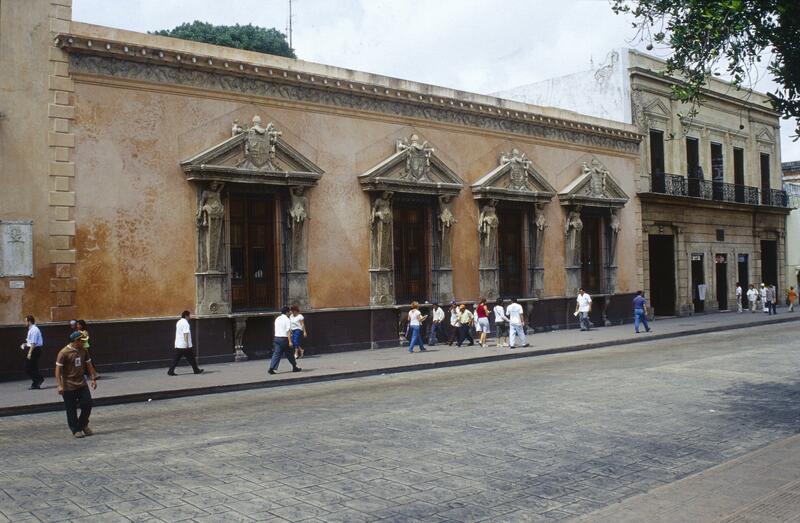 This building, named for Francisco de Montejo II, its patron and one of Mérida’s first Spanish residents, occupies the historic district of Mérida. Casa de Montejo has been renovated several times, and this portion owes less to its 16th century origins than does the central portal. 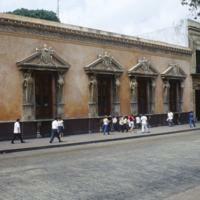 The Casa de Montejo ultimately occupied a full block of central Mérida. Elaborate caryatides flank each window—in this case, female figures atop inverted triangular columns. These date from a renovation carried out in the early part of the 20th century. The original patron of this house was Francisco de Montejo II, the son of a conquistador and a central figure in the settlement of Mérida. Later residents of the house—many of whom were descendants tracing their ancestry to Montejo—reworked the house to meet their changing needs. The current structure has thus had many patrons. Like many of the historic homes of Spanish America, this one eventually became commercial property, housing not a family but a bank. Today it is the property of Banamex.